Can Bonomo (born 16 May 1987) is a Turkish singer who represented Turkey in the Eurovision Song Contest 2012 in Baku, Azerbaijan. Bonomo was born in İzmir, Turkey to a Sephardic Jewish Turkish family. At the age of 17, he began his official career as a vocal productionist in Istanbul. At the same time, Can went on with studying TV and cinema at the Istanbul Bilgi University with his programmes being aired on popular radio channels such as Number 1 FM, Radio101 and Radio Class. Then his radio programmes were followed by programmes in international TV channels such as MTV and Number One TV. After his musical career, he began to write poetry and publish poetry books. His first poetry book was named "Delirmek Belirmektir" (2014) and it was published by Küçük İskender. In January, 2012, he was internally selected to represent Turkey in the Eurovision Song Contest 2012 in Baku, Azerbaijan. 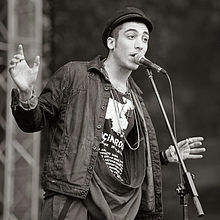 In February 2012, Can revealed his song "Love Me Back" to the public. He placed seventh with the song at the contest's final competition on 26 May 2012. 15th Radio Boğaziçi Music Awards "Best Album "
^ "We Play". We Play. Retrieved 2012-01-11. ^ "Can Bonomo to represent Turkey at the 2012 Eurovision Song Contest". EuroVisionary. 2012-01-09. Retrieved 2012-05-27. ^ "Yazmadıysa doğru değildir!". Medyatava. Archived from the original on 2012-09-06. Retrieved 2012-01-11. ^ Ron Kampeas, "Turkish Jews celebrate country’s Eurovision pick, but singer would prefer quiet about his religion", Jewish Telegraphic Agency, January 17, 2012. ^ "Müziğin dili, dini, ırkı olmaz". Sabah. 13 January 2012. Archived from the original on 2013-10-22. Retrieved 23 February 2012. ^ a b Barış Akpolat (22 January 2011). "Şarkıcı, oyuncu ve meczup karşınızda Can Bonomo". Hürriyet. Archived from the original on 2013-10-21. Retrieved 10 January 2012. ^ "Can Bonomo to represent Turkey at the 2012 Eurovision Song Contest | Eurovision Song Contest 2012 in Baku". EuroVisionary. Retrieved 2012-01-11. ^ Elif Berköz Ünyay (4 February 2011). "Kimdir bu Bonomo?". Milliyet. Archived from the original on 2015-07-11. Retrieved 24 February 2012. ^ Onedio.com. "Can Bonomo'dan Şiir Kitabı: Delirmek Belirmektir". Onedio. Retrieved 2016-12-11. ^ "Yazmadıysa doğru değildir!". Medyatava. Archived from the original on 2012-09-06. Retrieved 2012-01-27. ^ "Turkey: "Love Me Back" revealed as Can Bonomo's song for Baku". Eurovision. Retrieved 2012-02-22. ^ "İşte Eurovision Şarkımız". TRT News. 22 February 2012. Archived from the original on 2015-07-03. Retrieved 23 February 2012. ^ Mesut Yılmaz (23 February 2012). "Avrupa'yı oynatır!". Milliyet. Archived from the original on 2014-02-03. Retrieved 23 February 2012. ^ "Can Bonomo finalde!". Habertürk. 24 May 2012. Archived from the original on 2015-07-02. Retrieved 25 May 2012. ^ "Turkey 2012". eurovision.tv. Archived from the original on 2015-07-03. Retrieved 15 January 2013. ^ "Türkiye, Can Bonomo'yla Eurovision'da 7. oldu". Zaman. 27 May 2012. Archived from the original on 2015-07-03. Retrieved 4 June 2012. ^ "Can Bonomo'nun yeni albümü "Aşktan ve Gariplikten", Aralık'ın 2. haftası yayınlanıyor". dreamtv.com.tr. 30 November 2012. Archived from the original on 2014-02-01. Retrieved 8 December 2012. ^ "Ali Baba ve 40 Haramiler!". Gazete Habertürk. 1 May 2012. Archived from the original on 2014-02-01. Retrieved 4 June 2012. ^ "Aile İşi - Dizi Kadrosu". ATV. 29 February 2016. Archived from the original on 2016-03-06. Retrieved 29 February 2016. ^ "Kimdir Bu Can Bonomo?". canbonomo.com. 1 January 2011. Archived from the original on 2012-02-14. Retrieved 9 January 2012. ^ "Altın Kelebek'ler sahiplerini buldu - Hürriyet Magazin Hattı". Hurriyet.com.tr. Retrieved 2012-01-11. ^ ""Sonuçlar"". omumedyaodulleri.com. 4 March 2012. Archived from the original on 2014-07-06. Retrieved 31 March 2012. ^ "Radyo Boğaziçi En İyi Alternatif Müzik Sanatçısı Ödülü için çok teşekkür ederiz!". Instagram. 16 May 2013. Retrieved 16 May 2013. This page was last edited on 3 February 2019, at 03:34 (UTC).